POTOMAC, MD -- We all love it when a plan comes together. Maybe it's the work involved in preparation; maybe it's because the end result isn't always certain; or maybe it's because the arduous process makes ultimate success even sweeter. Whatever the reason, the Tournament Players Club at Avenel (TPC) in Potomac, Maryland, is a perfect example of a plan that took a great deal of work, almost didn't happen, and whose success has been syrupy sweet indeed. TPC Avenel draws a nice compliment of Tour players every year. 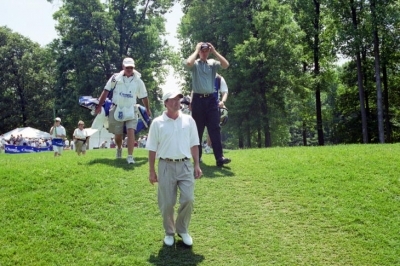 Here, it's Greg Norman strolling the 15th fairway. Golf Architect Tom Clark should know, since he's witnessed Avenel's entire evolution. His firm of Ault, Clark & Associates was chosen over two decades ago to oversee the design and construction of one of the very first TPC's (the fifth to open), and according to him, there's quite a story involved. 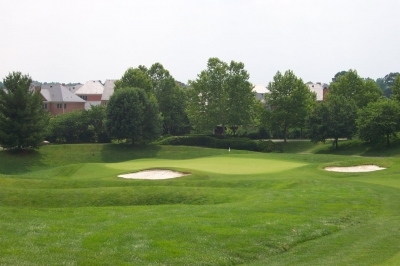 Most people see the course while walking it during the PGA Tour's annual Booz Allen Classic (formerly known as the Kemper Insurance Open), or even on TV, but don't have a clue as to how the beautiful golf facility went through some 'growing pains' to get to where it is today. Even the 'idea' took some time to take hold. "It's probably not widely known, but one of the first advocates for the development of the TPC 'stadium' concept is our firm's founder, Ed Ault. Mr. Ault, being a baseball player, really wanted to take the idea of golf tournament viewing to a new level, so spectators could enjoy watching professional golfers like you'd see major leaguers at the ballpark. He thought the 'ballpark' experience could be garnered by designing courses with wide setbacks from the fairways and stadium-like viewing areas for spectators," Clark said. He continues, "Deane Beman and Mr. Ault were friends, and when Beman became PGA Tour Commissioner, he was swayed to Ault's idea of building a series of courses to host tour events, rather than renting all the facilities like they'd been doing for many years. That was in the late 70's, and the idea really seemed to take off after that." Most people probably credit Pete Dye with the original creation of the stadium-golf concept, as he designed the very first TPC stadium course at Sawgrass near Jacksonville in Florida. But it was Beman who took Ault's idea and molded it into the model we see today. Beman hired Dye to take on the course design of the Sawgrass project (Ault, Clark & Associates handled the land acquisition), and the result was the first and most famous of all the TPC's (now there are 23, with two more nearing completion). TPC Sawgrass hosts the Tournament Players Championship, which will move to May in 2007 (known to many as golf's 'fifth' major). Justin Leonard looks relaxed, waiting to tee off on the par five 6th hole. In Avenel's case, the land was previously a horse farm that came under the ownership of an investment group that included Commissioner Beman and the PGA Tour. According to Clark, there were a lot of interests concerned: "Avenel was piece of property that several groups had tried for years to develop. Deane Beman was looking at the property as a potential site for one of these new TPC stadium courses. And when his group successfully bought the land, he offered the design job to us." There was some urgency, too. The Booz Allen Classic's previous venue, the nearby Congressional Country Club, had just announced its intention of pulling out of the annual Booz Allen event in order to bid for a US Open (which it hosted in 1997). As a result, Beman and the tour would need a new facility to host the tournament. "We of course jumped at the opportunity. I'll never forget the day Mr. Ault said, 'Well, we could do it for $30,000.' Brian (Brian Ault, Ed's son and Clark's partner at AC & A) and I said we should ask for at least $60,000. So we did that job for $60,000. Doesn't seem like much these days, but you can't put a price on exposure," Clark mused. No crowds to watch most of the year, but still plenty of great golf at Avenel. Here, the 15th green. Clark said the original plan was altered somewhat to fit the new TPC stadium format, which included expanding some of the corridors and re-routing the layout down the stream valleys that are so prominent on the course. And several other entities were also involved in the project. "The Washington Suburban Sanitary Commission owns an easement to a portion of the site adjacent to the first, second and third holes, and they wanted that saved for possible future considerations. The Montgomery County Parks Authority also wanted a portion of the site, and of course the developer wanted to save some space for houses," Clark remembered. He continues: "It sounds like it'd be a huge morass of bureaucracy, but it really wasn't. The plan was developed to literally satisfy everybody. We worked with an excellent engineering firm, so we were able to keep the setbacks far enough back so that there'd be plenty of room for spectators. We had regular meetings with the permitting authorities and were able to push everything through in three or four months, where it normally might've taken a year or longer." Clark said there's only one area where the course feels a little tight, and that's on the thirteenth hole, a 524 yard par five with out-of-bounds to the right side. 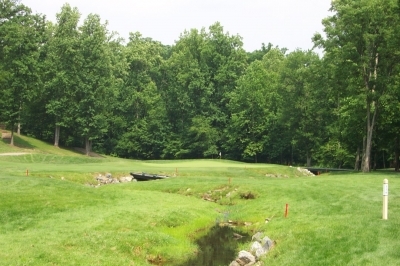 Despite the tight tee shot landing area, the hole consistently plays as the Booz Allen's easiest hole -- because too many trees were cleared along the right side nearer the green, where most people now play. He says the fairway was meant to be quite a bit to the left of where it ended up -- which would've forced many of the pros to play down that side, or face a much riskier shot to go at the green in two. 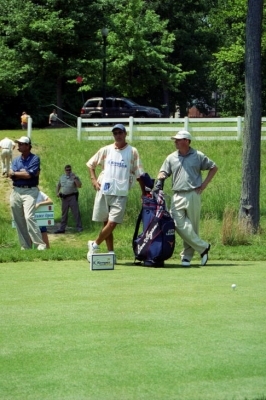 2002's final pairing included Bob Burns (foreground) and eventual winner Bob Estes. They're one shot into the round as they walk off the 1st tee. At one point during the process, PGA Tour Pro Ed Sneed was hired as a design consultant. Clark says Sneed really helped add some perspective: "Ed came for a number of visits when we got under construction, and really ended up benefiting the project. He opened our eyes to a lot of the things that players would truly enjoy about the course, like the incorporation of the short holes. So, we put a 300 yard par four in the middle of the back nine (#14) and another shortish par four on the front nine (#5)." 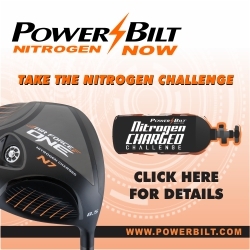 "Sneed believed that tour pros and everyday players tend to enjoy the same types of challenges. So ever since that time, we've tried to put at least one of those short holes on every nine we design. Ed also did a lot of hands-on work with some of the greens, such as adding the 'spine' that's in the middle of the twelfth hole," Clark said. That 'spine' is largely responsible for the 12th hole consistently playing amongst the PGA Tour's most difficult holes, year-in and year-out. Despite the overall success of the planning stages, there were a few areas where the original design thinking didn't make it into the final product, namely the bunkers. Even the pros dread the tough par four 12th hole, consistently one of the Tour's most difficult, each year. Clark elaborates, "We all worked together to create something that stands the test of time, and the shaper really did an outstanding job of framing the holes. The only area where we thought the course could improve was the bunkering." "Some of them were made too deep, and a few were completely invisible. There's nothing that a player likes less than not seeing a hazard. Then, once you get in it, it's very difficult to get out. There were a couple bunkers, such as the one that fronts the green on sixteen, that were supposed to be large and deep -- but not all of them," Clark said. As a result, a good many of the bunkers have been redone over the years, and Clark said a few more still could use some work -- but the problem's not what it once was. Reshaping the bunkering wasn't the only evolutionary change at Avenel. The course originally was sprigged in Zoysia grass, which does very well in this region. But a terrible ice storm in the early nineties killed the Zoysia crowns, causing the loss of about 11 acres of fairways that needed to be re-sodded before the Booz Allen could be played that year. A decision was made at that time to switch to bentgrass. Bob Estes hits his 3rd shot into the true 3-shot par five 2nd hole. "Now that it's all grown in and the transformation's complete to bentgrass, everything really looks great. Avenel's a terrific golf course, and I've always thought it's one of the top courses in Maryland," Clark said. The course itself is quite memorable to play, as are all PGA Tour venues. There's nothing quite like trying to execute the same shots as the best players in the game. It's as difficult as you'd expect, with the thick rough, undulating putting surfaces and yes, some very deep bunkers. But there's one aspect of a stadium course that benefits almost all duffers -- the wide driving avenues. Clark puts it this way: "These stadium courses are great for hosting professional golf tournaments, but they're also great for average golfers to play the other 51 weeks of the year because they're incredibly forgiving off the tee. Avenel's really only got one area where out-of-bounds threatens (on 13), and the rest of the course is pretty open." In this view of the 18th hole, you won't see the corporate tents, thousands of spectators or television towers. But you'll still feel the pressure to execute. Case in point is the finishing hole. With the wide amphitheater bordering the fairway and green complex, you'll never have to worry about penalties -- unless you count the deep bunkers in front of the putting surface. If you're in one of those, you'll be lucky to see the top of the flagstick. Also as you'd expect, there are some real aesthetic flashes of brilliance, most notably on 10, 11 and 12, all of which run alongside a stream. It was fun trying to duplicate Bob Burns' hole-in-one (made during the final round in 2002) on the 11th hole, though settling for a two-putt par was hardly a letdown. Clark describes the closing sequence: "The finishing holes, 16, 17 and 18, really make for a classic finish. Two difficult par fours and a par three over water, where the wind's really a factor. I remember the year when the wind was blowing in the players' faces on 18, and Tom Kite and Jeff Sluman couldn't reach the green with a driver-three wood. Then again, last year they're playing the same hole with a driver-nine iron." 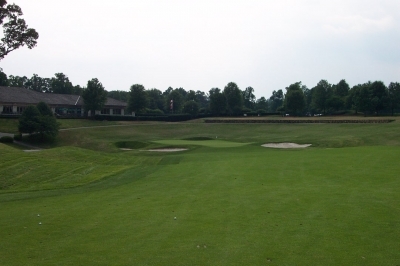 No matter the club selection, playing the TPC Avenel course is an exhilarating experience. And after receiving Tom Clark's guided tour through its history, the course is that much more special. We're all fortunate the plan came together, and thousands of fans every year will share in the benefits. Course Designers: Ed Ault, Brian Ault & Tom Clark of Ault, Clark & Associates. PGA Tour player Ed Sneed consulted. Note: TPC Avenel is a private club. Membership is extended by invitation only, on a space available basis. Inquiries should be directed to Jacqueline Corsey. (301) 469-3700.